Posted By:Unknown | At:3:15 AM Be the first to comment! According to a Monday report on GMA 7 news program "24 Oras", Binay closed the arena in 2011 because the then operator Jose Orillaza was not paying the right taxes and did not have the mayor's permit. The arena was opened again in 2014 under the supervision of a new operator named Gerald Go, Orillaza's former employee. Orillaza claimed that Go was merely Binay's dummy. Orillaza himself had admitted before the Senate that he was a Binay dummy as the president of Omni Security. Despite this, Orillaza alleged that Binay hastened the franchise's transfer to Go. Go had submitted a letter of intent to operate the sports arena on May 14, 2014. On May 27, and without the other required documents, Binay approved an ordinance that granted Go the franchise to operate the cockpit arena. "Pina-struck po nila ang lahat. Pati ho 'yung pagkakansela ho ng aming prankisa ay hindi ho kami binigyan ng notice," said Orillaza. Attached to Orillaza's complaint was an affidavit supposedly from Go, in which he claimed that the real people behind the re-opening of the cockpit arena were City Administrator Atty. Magdaleno Mendoza and Councilor Ferdie Eusebio, and that Go was merely a front for them. Meanwhile, Binay's spokesperson Councilor Mayeth Casal-Uy said that Orillaza also filed the same complaint before the Ombudsman in 2013 but it was ignored. Posted By:Unknown | At:4:23 PM Be the first to comment! The Supreme Court (SC) did not issue yesterday a temporary restraining order (TRO) that would stop President Aquino from appointing a justice to fill up the lone vacancy in the 15-member High Court from the four nominees submitted by the Judicial and Bar Council (JBC). Instead, the SC required the Office of the President, the JBC, and Chief Justice Maria Lourdes P. A. Sereno, who was also named a respondent, to comment in 10 days on the petition filed by Solicitor General Francis Jardeleza. Sereno is expected to inhibit herself in the deliberation of Jardeleza’s petition. The lone vacancy in the SC was a result of the retirement on May 22, 2014 of Justice Roberto A. Abad. Under the Constitution, the President has 90 days from the date of the vacancy in the SC to appoint a replacement from the nominees submitted by the JBC – a constitutionally mandated office that accepts, screens and nominates appointments in the judiciary and the Office of the Ombudsman up to the rank of Deputy Ombudsman. Nominated with six votes each were Court of Appeals (CA) Associate Justices Apolinario D. Bruselas Jr. and Jose C. Reyes Jr., Commission on Audit (COA) Chair Maria Gracia M. Pulido-Tan with five votes, and Quezon City regional trial court (RTC) Judge Reynaldo B. Daway with four votes. Aquino has until August 20, 2014 to name one of the four nominees as replacement of Abad. In his petition, Jardeleza claimed that the JBC committed grave abuse of discretion in excluding him from the list of nominees despite garnering enough votes due to an integrity question raised by Sereno, the council chairperson, during the final deliberations by the council. “The unlawful exclusion of petitioner from the JBC shortlist impairs the President’s constitutional power to appoint,” he told the SC. According to Jardeleza, he was qualified to be nominated by the JBC because he also got four votes like those garnered by Judge Daway. Posted By:Unknown | At:4:21 PM Be the first to comment! Richard Aboulafia, an analyst with the Teal Group, said airlines might be more proactive about avoiding hot spots, although he noted that there are very few areas where non-government militaries have weapons sophisticated enough to shoot down a plane. Former New York Mayor Michael Bloomberg strongly urged the FAA to "reverse course" and permit U.S. airlines to fly to Israel. Bloomberg released a statement saying he is flying on El Al to Tel Aviv on Tuesday night to "show solidarity with the Israeli people and to demonstrate that it is safe to fly in and out of Israel." "The U.S. flight restrictions are a mistake that hands Hamas an underserved victory and should be lifted immediately," Bloomberg said. Posted By:Unknown | At:4:19 PM Be the first to comment! (LAST UPDATE—11:11 a.m., Wednesday, July 23) 'Henry', with international name 'Matmo', has weakened into a tropical storm after crossing the landmass of Taiwan and is now outside the Philippine Area of Responsibility (PAR). All storm warning signals have been lowered in the country. 'Henry' continues to enhance the southwest monsoon bringing moderate to heavy rains to Luzon and Western Visayas. Residents in these areas are still advised to be alert against possible flash floods and landslides. Meantime, weather bureau PAGASA is now monitoring two low pressure areas (LPA) 1,140 km east of Southern Luzon (14.0°N, 135.8°E). The first one is expected to merge with the stronger one behind it. The first LPA, or the merged system, may enter PAR this weekend. After undergoing surgery to repair his broken left leg, Anderson Silva is now with his family for the holidays. The long time UFC light heavyweight champion even took time out to thank his fans for the support and wish them a happy new year. Marijuana users celebrated as Colorado became the first US state to allow retail cannabis sales, putting it in the vanguard of efforts across the country to legalize the drug. The western state famous for its ski resorts and breathtaking mountain vistas has issued 348 retail licenses -- including for small pot shops -- that can sell up to 28 grams of pot to people aged 21 or older, starting Wednesday. Movies? Planning what to do with the family on the (long or short) weekends ahead? I think most of us are excited to know what would be the next to watch out for. Here is a list of the new films that are getting released in 2014. Posted By:Unknown | At:3:02 PM Be the first to comment! Four cops have been arrested for firing their guns on New Year’s Eve. In an interview on ABS-CBN’s Umagang Kay Ganda, Philippine National Police (PNP) Public Information Chief Supt. Reuben Theodore Sindac said one of the four is also being considered a suspect for injuring a civilian in one of the recorded stray bullet cases. Manila, Philippines - Only a small percentage of Don Mariano Transit Corp.’s fleet of buses inspected so far passed the roadworthiness check being conducted by the Land Transportation Office (LTO). “We have inspected 47 buses so far and only 10 of these passed the roadworthiness checks,” said Joel Donato, chief of the LTO Motor Vehicle Inspection System (MVIS) center. All of Don Mariano’s 78 authorized bus units will be inspected, he said. MMDA opens 'zipper lane' but can it ease Metro Manila traffic? Posted By:Unknown | At:5:36 PM Be the first to comment! The Metro Manila Development Authority (MMDA) has opened up a “zipper lane” to help ease the morning rush traffic for Christmas. Now on its second day of implementation, the zipper lane aims to decongest traffic from Ortigas Avenue to Makati every morning in Metro Manila. Posted By:Unknown | At:5:35 PM Be the first to comment! A magnitude 4.3 quake hit Antique, Friday noon. According to the Philippine Institute of Volcanology and Seismology (Phivolcs), the quake struck around 12:48 p.m., some 34 kilometers northeast of San Jose De Buenavista, Antique. Intensity III was felt in Tibiao; Culasi; San Jose, Antique; and Caticlan. Posted By:Unknown | At:5:34 PM Be the first to comment! Gunmen opened fire outside Manila international airport Friday, officials said, killing four people including the mayor of a town in the southern Philippines, where political violence is endemic. Terrified men and women screamed and cried while a man, apparently fatally wounded, lay face down on the pavement outside the passenger terminal in a video clip uploaded to the local GMA television network's website. Posted By:Unknown | At:4:30 PM Be the first to comment! 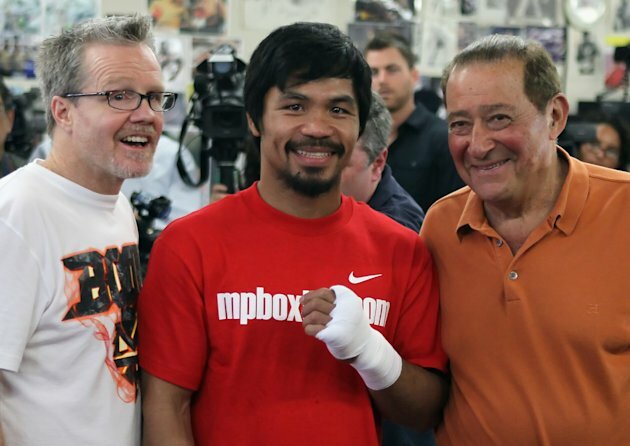 Top Rank Promotions boss Bob Arum came to the rescue of his most prized boxer by issuing a statement tosupport Manny Pacquiao’s claims that he already paid his taxes in the United States and is not obligated to pay any more in the Philippines. This comes at the heels of a warrant of garnishment issued by the BIR on his assets prompting the boxer to borrow money to fulfill his promise of helping out the victims of typhoon Yolanda. Just after winning in his match against boxer Brandon Rios, Manny Pacquiao is now bracing for his latest fight. This time, it's a bout outside the boxing ring. In an interview with ANC's Topstory, Pacquiao said the Bureau of Internal Revenue (BIR) has issued a warrant of garnishment to the banks, freezing all his bank deposits over his P2.2 billion tax evasion case. The Bureau of Internal Revenue (BIR) is going after the Sarangani Representative for back taxes from 2008 and 2009. During the period, Pacquiao reportedly earned tens of millions of dollars in five fights against the likes of Juan Manuel Marquez, David Diaz, Oscar dela Hoya, Ricky Hatton, and Miguel Cotto. All of the fights were held in Las Vegas, Nevada in US. Pacquiao’s lawyers argue that remittances to the US Internal Revenue Service (IRS) were not included in his tax returns in the Philippines because a tax treaty between the two countries stipulates that income tax paid by Filipinos in the US is creditable against income tax liabilities here. "Ayaw tanggapin BIR yung binibigay kong copy ng tax na binayaran ko sa US. Gusto nila original IRS copy, hindi naman nagbibigay ang IRS ng nun,” he said. Pacquiao’s lawyers have already filed an appeal on the warrant of garnishment issued by the BIR on his assets. The boxing champ remains confident his case can still be resolved. “Wala naman akong tinatago,” he said in a press conference. He, however, was not able to hide his disappointment over the decision especially now that he intends to help those affected by super typhoon and the magnitude 7.2 quake in the Visayas region. “Matagal ko nang gustong tumulong sa mga nasalanta ng bagyo at lindol. Pero ako po ay hinabla ng BIR ng P2.2 billion tax case na walang kabase-base at ang aking mga pera sa bangko ay ginarnish ng BIR. Hindi ako makapag-withdraw ni isang singkong sentimo sa sarili ko pong pera, hindi ko magamit para man lang makatulong. Ang pera kong ginarnish ng BIR ay hindi po nakaw at hindi po [Priority Development Assistance Fund] o [Disbursement Acceleration Program], ito po ay galing sa lahat ng suntok, bugbog, pawis at dugo na tiniis ko sa boxing,” Pacquiao said. Despite his tax case, the congressman said he will still fulfill his promise to personally deliver aid to areas devastated by Yolanda, even if he has to borrow money to pay for relief goods. "Mangungutang uli ako kasi siyempre nagpa-promise ako na pupunta ako sa Tacloban para tumulong sa kanila, e ano gagawin ko? Hindi matutuloy? Masisira ako sa tao," he said. Pacquiao said he earlier borrowed money to help at least 10,000 families in Yolanda-hit areas. His accounts had already been garnished when the super typhoon ravaged parts of the Visayas, he said. Posted By:Unknown | At:4:10 PM Be the first to comment! 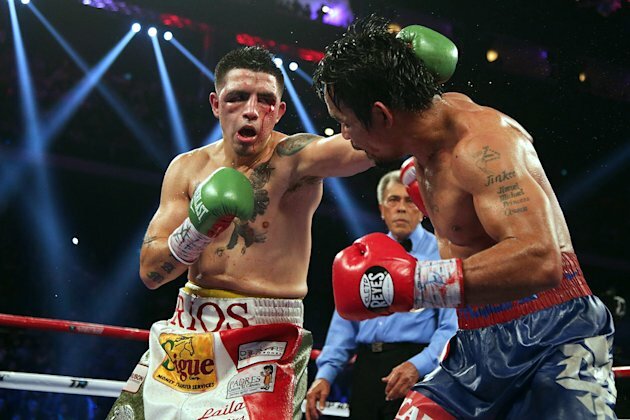 Before anything else, I send my congratulations to Manny Pacquiao for having bounced back from two successive defeats and totally outclassing Brandon Rios in Macau. While Manny’s first sortie atop the ring in nearly a year showed to the whole world that he still is among the elite, his opposite number was not, and that was a surprising disappointment. After all the words hurled by Rios and his camp, I really thought it would be an epic struggle that may trigger a new saga in both fighters’ careers. Instead, a rematch would be both a box office bust and a waste of a future Hall-of-Famer's time. All eyes are green with envy for Kris Aquino's deep V-neck dress. Pinoy-Trend.blogspot.com DOES NOT claim OWNERSHIP or COPYRIGHT of the photos and video listed in this site unless said claimed by the site.